Over the years we have collected various little things, which we have combined into this page. The original authors are not known to us. If you authored any of the below fragments, please let us know. We'll either add your copyright notice or remove your work, whichever you prefer. We welcome your contributions, but retain the right to refrain from publishing without notice. If you don't like it, skip it. Best of Proposed New Opcodes. Complete List of Proposed New Opcodes. 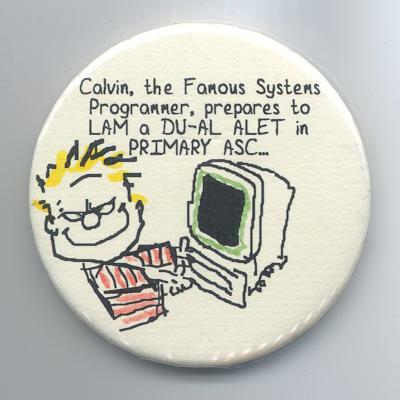 Calvin, the Famous Systems Programmer. Due to the fact that so many users have asked for an operating system of even greater capability than VM, IBM announces the Virtual Universe Operating System - OS/VU. Running under OS/VU, the individual user appears to have not merely a machine of his own, but an entire universe of his own, in which he can set up and take down his own programs, data sets, system networks, personnel, and planetary systems. He need only specify the universe he desires, and the OS/VU system generation program (IEHGOD) does the rest. This program will reside in SYS1.GODLIB. The minimum time for this function is 6 days of activity and 1 day of rest and review. In conjunction with OS/VU, all system utilities have been replaced by one program (IEHPROPHET) which will reside in SYS1.MESSIAH. This program has no parms or control cards as it knows what you want to do when it is executed. Naturally, the user must have attained a certain degree of sophistication in the data processing field if an efficient utilization of OS/VU is to be achieved. Frequent calls to non-resident galaxies, for instance, can lead to unexpected delays in the execution of a job. Although IBM, through its wholly-owned subsidiary, The United States, is working on a program to upgrade the speed of light and thus reduce the overhead of extraterrestrial and metadimensional paging, users must be careful for the present to stay within the laws of physics. IBM must charge an additional fee for violations. OS/VU will run on any IBM x0xx equipped with Extended WARP Feature. Rental is twenty million dollars per cpu/nanosecond. Users should be aware that IBM plans to migrate all existing systems and hardware to OS/VU as soon as our engineers effect one output that is (conceptually) error-free. This will give us a base to develop an even more powerful operation system, target date 2001, designated " Virtual Reality". OS/VR is planned to enable the user to migrate to totally unreal universes. To aid the user in identifying the difference between "Virtual Reality" and "Real Reality", a file containing a linear arrangement of multisensory total records of successive moments of now will be established. It's name will be SYS1.est. The items below were selected from the complete list of proposed new opcodes. You are invited to submit your favorites for inclusion. Please use the e-mail address at the bottom of this page. HELP Type "No Help Available"
The image below was conceived by Michael Stack, drawn by Jenny Beaven. To Best of Proposed New Opcodes. To the complete List of Proposed New Opcodes. To Calvin, the Famous Systems Programmer. © Copyright: various authors. All rights reserved.